Provide your guests with something extra at your event by hiring a fully equipped Photo Booth from KG Entertainments. Be it for a wedding, birthday party, family gathering, or any other type of event, hiring a Photo Booth is a really fun addition. It can help bring people together, break the ice, and encourage engagement – so be it for a party or a corporate training conference, our Photo Booth is a great fit. All the necessary equipment is provided by us; backdrops, handheld props, camera, lighting, and booth attendant. We take care of everything. We can even supply the props in a theme of your choice (at extra cost), be it a wedding, hen party or graduation event. You are then able to look back on both some really touching and silly moments, having pictures that make you smile for years to come. These are also fantastic things to share with the guests themselves, providing a memento of the event itself, as well as the people who shared the fun together. Whether you are looking for photo booth hire in Brighton, a party photo booth in Guildford or Surrey, or a wedding guest photo booth anywhere else in the South East of England, we have got it covered. 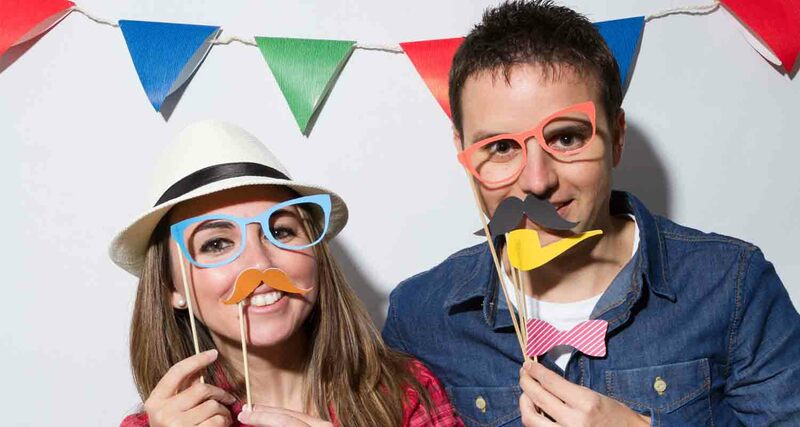 With several years experience in supplying Photo Booths with props for parties, we know just how well this goes down with guests. Get in touch to find out more about our event photo booth hire, from KG Entertainments.